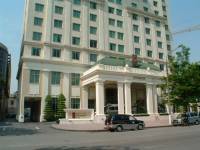 Arriving back in Hanoi in the early hours, we checked into a day room at the 3* Dan Chu hotel. 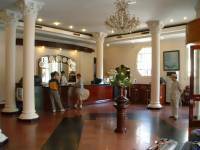 This is a wonderful old French colonial building situated at the heart of the city near the Hanoi Opera House. The room is big with old traditional Vietnamese furniture. There is a lovely courtyard at the back of the hotel which unfortunately is being used as a tradesmans entrance instead of a lovely courtyard bar & restaurant. The restaurant inside the hotel is dark & airless. I was very pleased to learn that the hotel is going to close down for refurbishment soon - one to watch for next time. This morning in Hanoi was for us to inspect new hotels & visit hotels that we have been using for a while. 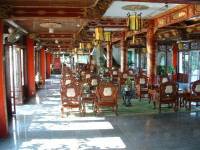 We visited the 3* Hoa Binh hotel that we have used in our standard category. This delightful hotel is full of character, dating back to the 20's. The magnificent original stained glass window in the restaurant proudly shows the daylight shining through. The French colonial style is strongly felt at the reception & throughout the building. The rooms are decorated with Vietnamese furniture. A surprise discovery was the 3* Army hotel. 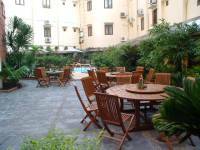 Unusually for a 3* hotel, it has a fine swimming pool - in Hanoi, usually only 5* hotels feature swimming pools. The reason is the history of the building which used to act as a guesthouse for important guests of the armed services - hence the name. In fact, the adjoing building is still used for officials, but the main part is now a comfortable hotel with large rooms decorated with lovely Vietnamese old style furnishings. For superior hotels, we we visited the 4* Sunway a modern hotel that is bright & comfortable in a quiet location in the famous old district, and the 4* Guoman hotel which is also excellent .The building is imposing with lovely reception & spacious comfortable rooms, nut unfortunately there has been & still is some building work right next to the hotel that affecting some of the guest rooms. We were also delighted to discover the 4* Desyloia hotel, a lovely boutique hotel beautifully decorated throughout in art deco style. 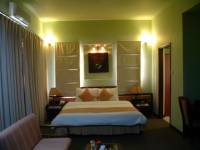 The rooms are elegantly furnished in French & Vietnamese style. We started our 5* hotel inspection at the Sofitel Plaza, which was right up to the usual deluxe Sofitel standard. Although the hotel is not at the heart of the city it commands a panoramic view of two lakes, the Red River & the city. 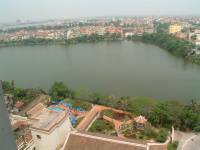 Nearby is the new 5* Sheraton hotel, situated on the picturesque shore of Hanoi's largest lake. The lovely swimming pool is beautifully landscaped in the courtyard garden whose lawns slope down to the edge of the lake., a very peaceful & relaxing setting. The entrance of the hotel is most imposing - young men in traditional Vietnamese costume welcome you at the open gate as your car arrives at the hotel and you step through into an open courtyard, like an old Chinese house, where two Vietnamese girls in their Vietnamese dresses will open the big hotel door for you to enter the lovely lobby. The hotel is beautifully decorated in elegant style, and many rooms have fantastic views of the lakes & the city. We flew to Hue in the late morning. We had been invited for lunch with the manager of the Huong Giang hotel, which we use in our Superior group in Hue. This is a hotel with a very good location by the river and many of the rooms have lovely river views. The hotel is decorated in an 'Imperial Chinese' and there is a lovely garden and swimming pool by the river. Mr. Nguyen Ngoc Tung, the general manager, told us that all Dragon Travel's clients will be located in the front river view rooms only. We also inspected two 3* hotels for our Standard group. The first one, the Asia hotel, is newly opened and a big surprise. The quite ordinary new building outside does not give a hint to the beautifully decorated rooms which are furnished with designer lighting, fabrics & furniture. The small hotel also has a rooftop swimming pool with restaurant offering magnificent views of the city. The second 3* hotel is the Festival. This hotel has built a lovely new wing behind the swimming pool making it now a courtyard in between the old & new buildings, with a swimming pool & garden sitting area with chairs & tables. This has become a wonderful setting & has a homely feel. The rooms in the new building are brighter & bigger and we will use only the new wing for our guests.